Making an affordable and high quality measuring system is not an easy task, but luckily we are not alone. Bee sensor systems are not new to the market and different groups have shared and improved open source designs. We use and share knowledge with these groups and also share our designs. In this way we make use of the combined strength of many organisations and volunteers who have a great deal of knowledge in this area and who have often delved into it professionally. Measuring temperature and humidity (both inside and outside the cabinet) is going well and provides relevant information. Sending the data wirelessly 1x per 15 minutes to 1x per hour (depending on the change in the measured values) goes well via the LoRa network. The system is energy efficient enough to be able to measure for two years on two AAA (thin penlight) batteries and to send data. Sound measurement is not yet working satisfactorily, as too few frequencies are being analyzed and more clarity is needed about the conclusions you can draw from this. We are also not completely satisfied with the long-term precision of the weight measurement at fluctuating outside temperatures. 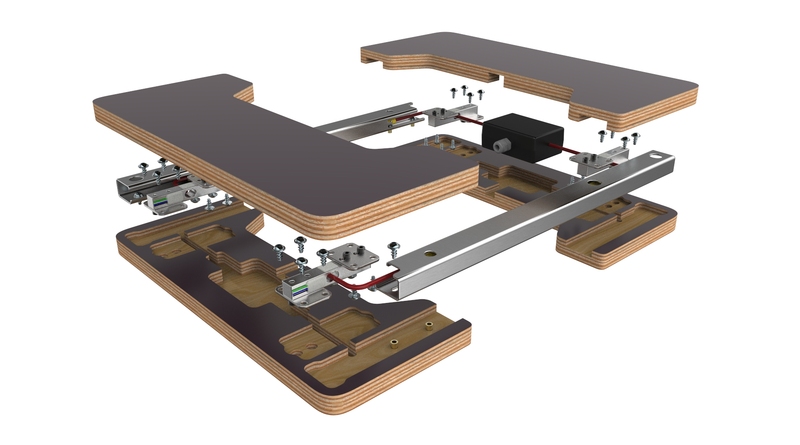 The CNC milling of the wood takes a lot of time: about 8 minutes per board and therefore 32 minutes per measuring system. The assembly time of one whole measurement system is now 3 to 4 hours. To be able to deliver an affordable measuring system, it must be possible to assemble the assembly in approximately 15-30 minutes, or to deliver it as a DIY kit. A clear draft is therefore needed here. Because the measurement of parameters such as temperature and humidity is running smoothly, our current focus is now on the important value: weight. Weight sensors, also called 'load cells', usually consist of an aluminum rod in which the deformation caused by a load is measured by a change in resistance of a small strain gauge. Load cells are designed to briefly weigh items such as people and goods. In the case of the hive, however, we want to weigh continuously. Although the sensors are not always switched on (this is not necessary and would cost too much power), the load on the cabinet always presses on the sensors. At the same time, environmental factors such as temperature and direct sunlight influence the measurements. In particular, shifting temperatures influence the readout of the load cells. In V1 we have corrected this in the software as well as possible and used this correction in the hardware and software of V2. However, in the tests in a controlled environment we came to the conclusion that these corrections are not sufficient to make a reliable weight measurement of the changes in the hive weight. Among other things because the influence of temperature on the measurements differs per sensor and can change per sensor. There is also a time difference between when the temperature influences the measurements and these can also differ per sensor. Lastly, we suspect that the wood, to which the sensors are attached, could also influence some inexplicable measurement effects. All in all, many uncertainties added together, which now make the measurements accurate to +/- 200 grams (in a total weight range of 0-125 kg). Why is reliable weight data important? As mentioned, the temperature influences the weight measurements. How much this is, may vary. For example, when interpreting weight data, one may want to see the difference in weight gain or loss per day. This can vary from half to full kilograms, depending on the weather conditions. When the actual changes are subtle, e.g. when monitoring stock usage in winter and early spring, these changes easily cause errors in interpretation. The current V2 measuring system is accurate to approximately 200 grams (over a total range of 0-125 kg), but we want to achieve an accuracy of 50 grams in order to be able to clearly visualize small changes. Other factors also play a role: rain and snowfall, moisture absorption in e.g. wooden hive parts, condensation in the hive or hive. The more variations, the more unreliable and the more chance of confusion for the user of the data. This may lead to incorrect decisions. The sound data use are also still being developed. A lot is already known about the measurement of different bee-specific frequencies (eg the E.64 Woods apidictor from 1964) and there are systems on the market that use this data to determine whether a bee colony is in trouble. But much research is also being done into measuring sound in the hive and deducing a reliable conclusion that can be used to make the life of the beekeeper easier. Several volunteers and research groups working together with Beep are working on this. However, the sound analysis must also be able to work on a very small and energy-efficient processor to make the system usable and durable. The latest state of these developments will be published here as soon as there are useful results. We are currently working hard to further develop and test version 3 of our measurement system. For weight measurement we want to see if we can achieve better reliability with a nicely designed steel (instead of wooden) frame and one weight sensor. For the noise measurements we will use the latest results from our research groups. We expect to soon reach our optimum in terms of costs and measurement precision. As soon as we have an idea of this, we will start a crowdfunding campaign for the first series of around 200 pieces of the V3 measuring system. You can subscribe below for the latest updates. We will send you the latest news about the app and the measurement system by email on a regular basis (maximum 1 per month) if you subscribe below.